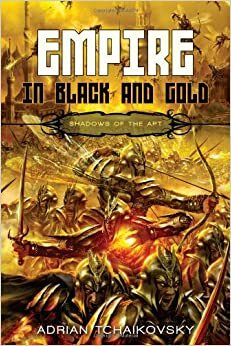 Empire in Black and Gold is the first book in the Shadows of the Apt series. The series is finished, it consists of 10 books and it has garnered flattering reviews from the blogosphere. I have been circling it for some time and finally decided to give it a go. At the beginning, the author throws us in the middle of a battle for the city of Myna, where Stenwold Maker and his friends are trying to help the city fend off the attack of the Wasp Empire. In the midst of all chaos, we are presented with barely a sketch of a somewhat different fantasy setting. I really like my FSF this way. At the start, you see a tip of the proverbial iceberg, and then your patience is rewarded as you read along. The city of Myna is lost and twelve years later, we are back in the presence of Stenwold Maker, who, ever since the fall of Myna, has vainly preached against the threat of the Wasp empire in his home city of Collegium. All the while, he has been training young agents to aid him in his covert fight and to be ready when the time comes to fight in the open. 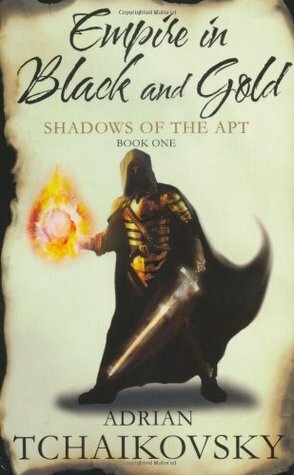 After several years of piece, the Empire is on the march again and Stenwold activates his latest recruits —his niece Che, his mysterious ward Tynisa, Prince Salma of the Dragonfly Commonweal, and apprentice artificer Totho – to spark resistance and expose the sinister agenda of the Empire. They are also joined by his old friend Tisamon, a master swordsman. As the book progresses, we are drawn into a unique fantasy world. 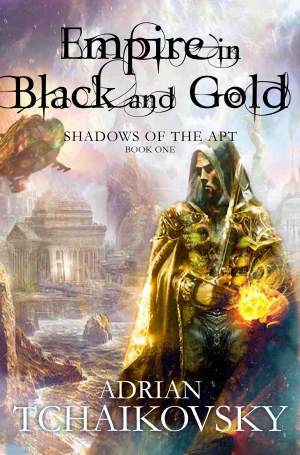 Rather uncommonly for the fantasy genre, the author does not shy away from the use of technology. However, it is not merely used to set the world apart from the usual medieval fantasy setting. Technology is here an important plot device. The world of the Shadows of the Apt is at a turning point as the inevitable industrial progress brings change that strongly reflects in the thoughts and actions of the characters. On one side there are the kinden that are apt, which means that they can use machines and complex tools to even build aircrafts of various designs, and they represent the new world, world of technology, science and progress. On the other side, representing the old world ruled by magic, myth and mystical powers, are the inapt kinden, who are unable even to unlock the door with a key. Maybe the most unique trait of this fantasy setting is the fact that the races of its inhabitants have names and certain characteristics of insects. I only recently found out that Tchaikovsky derived his inspiration from an RPG that he had been playing, which had the insect races in it. The beetle kinden are stocky, enduring and the best artificers among all kinden. The wasps are aggressive, spiders devious, ants strong and good soldiers, mantises perfect warriors, and so on. Each race has some unique art - wasps can fly and create balls of energy from their hands, spiders can affect other people’s emotions, ants can talk to each other telepathically. As for the plotting, the book is reminiscent of a war/spy/adventure novel. The Wasp Empire is represented by Thalric, who is the chief antagonist. He is an officer in the secret service of the Wasp Empire and he is an excellently crafted character - a villain who is a hero of his own story. The book as a whole makes a very good read, but does have certain flaws, mainly concerning the pace. I had the impression that the author had so many ideas and just had to present them all in the first book, which made it a little hard to read at times. Because of that, I was reluctant to continue with the series, but I eventually gave in and read the next one, the review of which will, hopefully, be posted on this blog, soon. My grade: 3 1/2 out of 5.